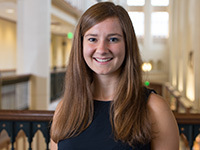 Congratulations to Glynn Family Honors Program seniors Tim Seida and Laura Neis on winning Undergraduate Library Research Awards in the Senior and Honors Thesis category. Tim received First Prize and Laura received an Honorable Mention. Dr. Claudia Polini, a distinguished member of the Notre Dame Mathematics faculty, has been appointed the Glynn Family Honors Collegiate Professor of Mathematics for a three-year term. The National Science Foundation (NSF) recently announced the winners of the 2017 Graduate Research Fellowship Program (GRFP). 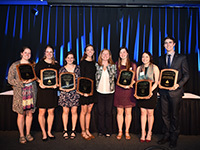 Overall, 15 Notre Dame students, affiliates, and alumni won the prestigious award. Among this decorated cohort are five current College of Science undergraduate and graduate students and four alumni. The fellowship was designed to recognize and support outstanding graduate students for three years of study in the fields of science, technology, engineering, and mathematics (STEM) who are pursuing master’s and doctoral degrees in the United States.